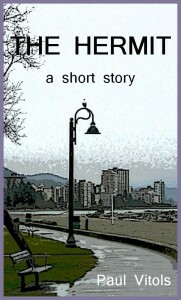 So begins The Hermit, a short story written during my first term at the University of British Columbia in 1979. The opening marks a decisive moment in the life of Alex, the story’s student hero. To an outside observer, Alex seems to be in trouble. Like many students—me, for example—he finds university to be alienating rather than empowering. And, like so many others, he responds by withdrawing. But while this entails turning away from everything he previously believed would bring him satisfaction, the withdrawal enables Alex to find “a tiny point of clarity at the center of a rich, rotating world.” And in this point of clarity we, as readers, sense something more: the birth of vocation. As the lonely young man walks the Stanley Park seawall, he begins to embrace something he is only just starting to understand: the life of an artist. Inspired by James Joyce’s desire to offer his beloved Dublin as a gift to the world, I set Alex’s thoughts and actions against the somber and evocative background of autumn in Vancouver. His impromptu walk occurs on a specific date, chosen for symbolic reasons that I invite the curious reader to delve into. As I read the story now, I see that Joyce inspired me in another way. Just as his A Portrait of the Artist as a Young Man can be read as an artistic manifesto, so too can The Hermit. I am pleased to offer it as such for your consideration. While I hope that budding artists, established artists, and even fans of Joyce can relate to The Hermit, I trust that you don’t need to belong to any of these categories to appreciate it. For the question of vocation touches us all, and every life has its moments of crisis. I invite you to join Alex in Stanley Park on November 9, 1979, for his crisis, which is none the less profound for being invisible to others. You can share with him the strange and solitary experience of hearing—and answering—a life-changing call. You can’t buy The Hermit from bookstores, but you can get it as an ebook for free (along with other bonuses, previews and discounts) when you join my mailing list. No e-reader? No problem. Download your free Kindle reading app here. If you download the app, I receive a small commission. Think it’s high time you bought a Kindle, or upgraded your existing device? Shop on Amazon.com, Amazon.ca, or Amazon.co.uk (once again, if you use these links to buy, I receive a payment).